Working as a technician in a power plant, one of my duties is to operate, and maintain the Continuous Emissions Monitoring system (CEM). I have spent many hours standing in front of analyzers that measure Nitric Oxide (NOx) Carbon Monoxide (CO) Ammonia (NH3), Nitrogen (N2), and even Oxygen (O2). Having stared at the instruments for so long, so many times, I have often thought about some of the more interesting facts of Oxygen; sad but true. * The fact that the Y is pronounced like an E is very cool. * Oxygen by itself is not explosive, but if we think back to our Fire Triangle, a fire needs 3 things to burn; fuel, heat, and oxygen. By enriching various material with higher concentrations of Oxygen, fire has a better chance of breaking out, and sustaining itself. * The “air” that we breath is not 100% percent oxygen. The atmosphere contains only 20.90% Oxygen. 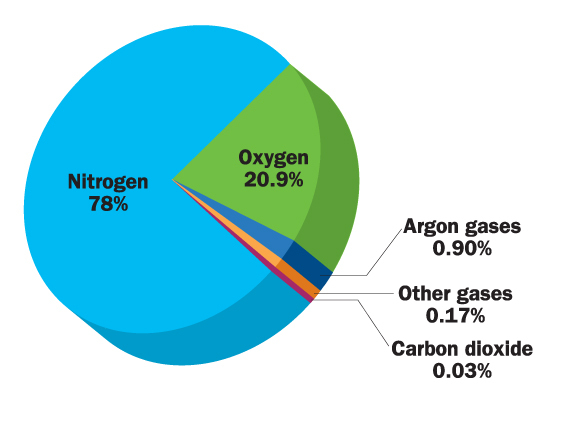 78% is Nitrogen, so if you want to be a trend setter, you can tell people you want to step outside for a “breath of fresh N2″…….well, setting trends in geek circles anyway. * Oxygen deprivation is obviously not good for you, but excess oxygen can be just as bad. OSHA state O2 levels below 19.5% or above 23.5 are undesirable. * The U.S Olympic Training Center is in Colorado Springs , CO. The “air” is still 20.90% O2 but because the air is thinner, less volume of air is available to the lungs. The lungs grow accustomed to this, and are able to function better when athletes are “out of breath.” It would be like me when I climb the stairs with a large plate of buffalo wings, and french fries…………for instance??? Really interesting, I’m learning so much.